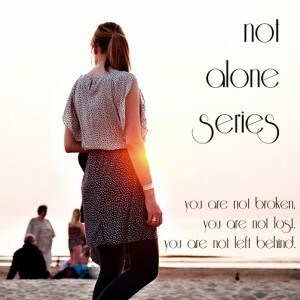 After a summer break, I’m back with the Not Alone Series Link-Up! I meant to post over the summer in our monthly theme’s but time got away from me over the summer. This weeks theme is LOVE SONGS! If God is love, then every love song is a song about God. What are your favorite love songs? They can be about romantic relationships, family relationships, or the love of God. What is your favorite hymn or Christian pop song about love? What secular love songs are your favorite? Have you ever heard a song that didn’t seem like it was about love on the surface, but after further listens, you heard the truth? If you’re married, what was your first dance song? I went through Lindsay’s prompts and picked out some of my favorite songs God related and just Life related. I also included some contenders for our First Dance Song. So Enjoy. I heard this on a retreat when I was in college. I always loved it. But it never became that popular. It has a good beat and good words all about how to follow Jesus and God. It gives clear examples as well. I’m bad at describing why I like songs so bare with me and just listen. This song used to wake me up on the radio almost every day. I’ve always enjoyed it even years later. I’ve heard several different artists sing it so it has made the rounds. I actually found out about this song through the Not Alone Series. I think that is kind of how we got our name. It was pinned as our “theme song” for awhile. I think it really says a lot about how singles feel sometimes and that we really aren’t alone even though we think we are. This isn’t necessarily a “love song” but they said we could share our favorite hymns and so this is mine. I’m hoping to have this song played at my wedding mass. The lyrics of this song is really pretty accurate to my fiance and I’s courtship. In the song, she wants to meet him by July so they can watch fireworks. We met in March and were able to watch fireworks that first year we met and every year after that. Then she says that they’ll marry on an April night and we are getting married in April! So crazy! I don’t think my fiance is 6’2” but he is pretty close and much taller than me…but I’m kind of short. Tom sent this song to me when we first started dating and he sings it to me all the time. This song was super popular when we first started dating in April/May 2015. It would play on the radio almost every day when I was driving home from work. Listening to that song so much made me realize I was in Love with him. So this is another option. We haven’t decided yet as we have until about March to figure it out. Go visit Lindsay for more posts and thank you Lindsay for hosting! Man, I wasn’t even into Matt Maher yet when he released that album! I’ve seen him play live a few times before, and I think he did that song. It sounds familiar.